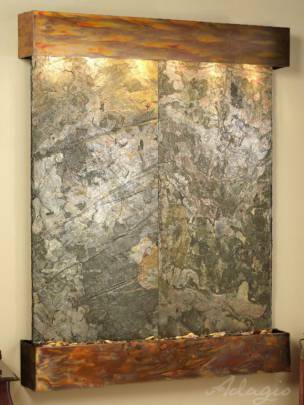 Wall Mount - 53.5" x 34" x 6"
Calming Waters is a horizontal wall-mounted waterfall that can add beauty to any home or office. Freestanding - 60" x 96" x 14"
Grandeur River is one of our largest freestanding water features. This impressive water fountain comes in a variety of metal finishes. Freestanding - 84" x 120" x 14"